What happens when you get an unexpected invitation to travel with your family?!! Well, that happened to me and I couldn’t turn down the chance to meet my Mom, Dad and sister in Amsterdam 2 weeks ago and travel with them to Paris. The trip came about quickly and suddenly. But, thanks to WOW Airlines I was able to find a super low fare flying into Amsterdam from DFW and out of Paris back to DFW. With a no-frills airline like WOW they charge for EVERYTHING including checked luggage. For a carry-on bag, the fee is lower which is another great reason to always travel with just carry-on luggage. But…I took a breath and referred to my own advice I’ve been giving here for all these years and to the materials in my Carry on Capsule Kit: Europe Fall. I used my capsule template to help me establish my core capsule of essential items. Then I added a mini-capsule of more fashion-y items like a leather jacket, blazer and a graphic tee. And I followed my own advice of bringing in color and pattern in with accessories. In this capsule, a leopard print scarf is all I needed to give a nod to the animal print trend. I also added in splashes of red with a belt and silk scarf. Plaid and checkered patterns are popular right now so I introduced that trend in with a lightweight long blazer. I also found, during a last minute shopping excursion, the Gramercy Track Pant from Athleta which is a light as air, wide leg pant. The Tribeca cropped wide leg pants from Athleta were a staple of my summer travel and everyday wardrobe and since these were the longer version of them I included them in my Fall capsule. Here’s the Gramercy Pant in action-they pair well with sneakers, and a leather jacket adds a little European flair. 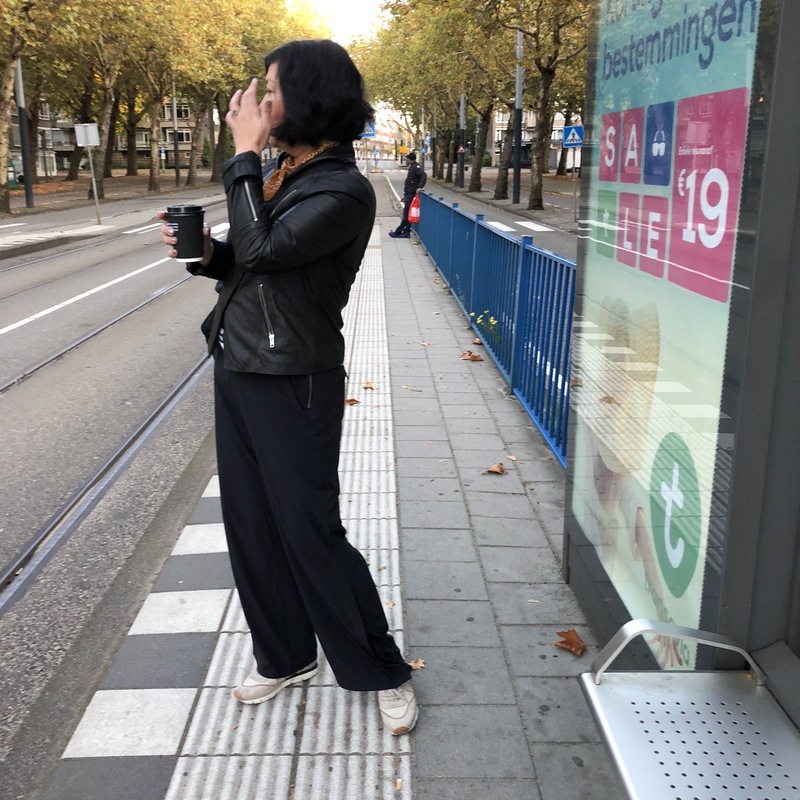 Once in Europe, I felt comfortable and confident in my capsule and travel outfit options. I even got complemented in Amsterdam on my outfits. This is the whole reason why I started Travelista and put the Carry-On Capsule Kit together to help you pack the right clothes for your trip and clothing style so that you can feel confident during your trip. Packing less does not have to mean sacrificing style if you are purposeful about your selections. This has been one of my favorite capsules to date. You can winterize it by adding base layers and replacing one of the jackets with a lightweight puffy jacket and replacing the lightweight open knit sweater with a merino wool or cashmere sweater. I did not add a dress because honestly I’m just not a dress person but you can easily add a lightweight dress option. My “dress up” outfit consisted of my jeans or wide leg pant topped with the leather jacket. In tomorrows post you’ll find the links for the items in this travel capsule. P.S. 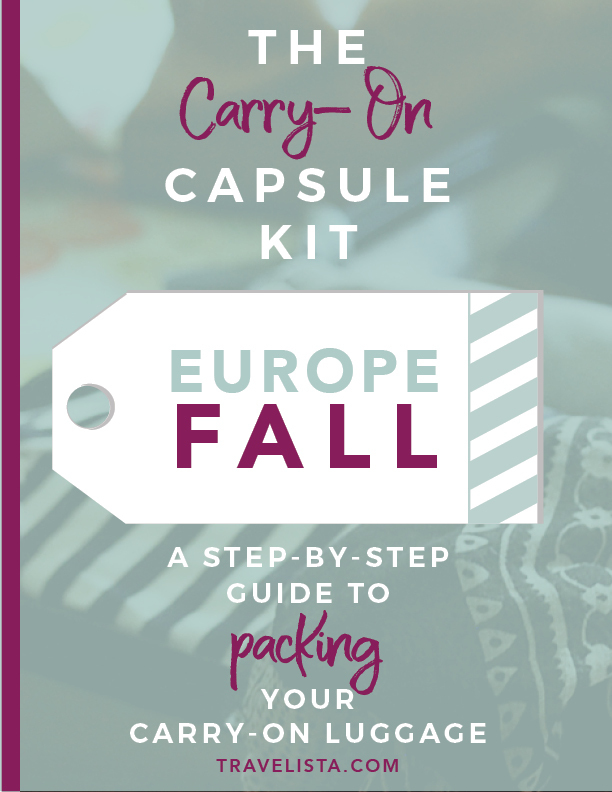 If you want to use the same templates, tools and checklists that I use every time I travel check out the Carry-On Capsule Kit: Europe/Fall that I’ve written. It’s a complete resource for packing light in carry-on luggage in 10 steps complete with bonus sample capsules.